Elderly women from East Nusa Tenggara are going to fly to India to learn about the production of solar energy. After six months of training, they’ll return to bring power to their villages. The four elderly women are on a mission to bring electricity to their villages in East Nusa Tenggara. These women, who are scheduled to go to India on Thursday, will have a six-month training program at Barefoot College to study applied solar technology. More interestingly, these women can barely read or write. The women are part of a program with the Wadah Titian Harapan Foundation (Wadah). 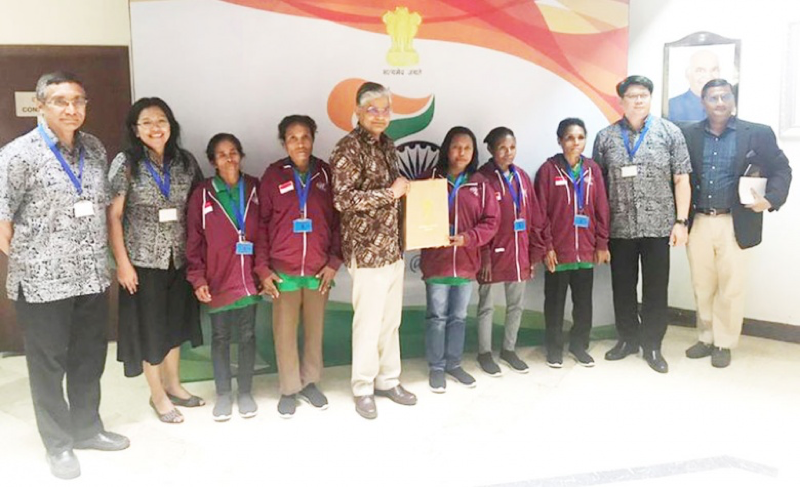 Since 2013, with the help of the Indian Technical and Economic Cooperation (ITEC) program, the foundation has sent 14 women from eastern Indonesia to learn about solar panels in India in two batches. “These women have changed the lives of everyone in their villages,” said Anie Hashim Djojohadikusumo, the founder and president of Wadah Titian Foundation, in her speech at the ITEC Alumni Day at the Ritz-Carlton hotel in Jakarta on Saturday. The locals now can work for longer hours. In the evening, women can continue weaving, men can make preparation for planting in the field, and the children can study and do their homework. Barefoot College, which focuses on women and community empowerment across the globe, requires that the participants of the program be women above 35 years old and illiterate or semi-illiterate. The Barefoot program deliberately chooses women who already have children to reduce the risk of them moving out of their village. The women, with their knowledge on solar panels, will be in charge of leading their communities in managing the electricity. “These grandmothers — that’s how we call them — also teach other people in the village about the solar technology, sharing their skills to create and maintain solar panel tools,” Tyas added. The program in India is sponsored by the Indian government’s 55-year-old ITEC program, which offers scholarships for short training programs, particularly for working-class people. The training programs, mostly last from 10 working days to six months. “The ITEC program, which started in the mid-60s, has the intention to support newly independent countries that are facing similar problems in recovering from colonialism,” said Indian Ambassador to Indonesia Pradeep Kumar Rawat in his opening remarks at Saturday’s event. “The program has provided [Indonesian] trainees a unique experience in India. Their experiences have helped to enrich the training program,” Rawat said. The program, which is a two-way experience, also benefits not only the future of the trainees but also helps solve problems that are being faced by Indonesia, India and other developing countries, he added. India, which has the largest English speaking community in the world, has proven its skills in science and technology, IT, pharmacy and engineering fields. The ITEC program, which offers various subjects from technology to business subjects, has brought over 800 Indonesians to India to take part in training programs since 2012, according to the Indian Embassy’s second secretary, Ajit Singh. For the past year, 33 students have gone to India through ITEC programs and four are going to India soon. The Indian Embassy also offers scholarships to Indonesian college students with the Indian Council for Cultural Relations (ICCR). The embassy allocates more than 150 scholarships for Indonesia each year. Now, more than 1,300 Indonesian scholars have availed the scholarships in India. Among other scholarships offered in Indonesia are the AYUSH scholarship program covering medicine and the Scholarship Program for Diaspora Children (SPDC) program. The celebration event was also attended by the Indonesian Research, Technology and Higher Education Ministry’s director-general Ali Ghufron Mukti, Indonesians who have received training scholarships in India, Indian students who studying in Indonesia, and the Indian Embassy officials.